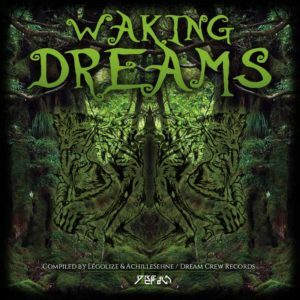 Compiled by Légolize from Voodoo Hoodoo Records and AchilleSehne from Visionary Shamanic Records, Waking Dreams is the first compilation from Dream Crew Records, a new label based in Morocco focused on exposing local talent. Most of the artists on this release hail from Morocco and the label is very proud to present these fresh tunes in a variety of psytrance styles, always keeping a dark direction. Mastered by Antagon at Antagon studio with artwork by Légolize. MP3 Download | FLAC Download | WAV Download · Download count: 13,151. Track 4 and so far so good; This is going to be interesting to hear how well tunes sound at higher BPMs. good to have this !!!!+!!+! !+!